Give your bedroom a fresh update with the contemporary styling of Syracuse II beds. 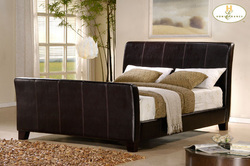 Available in two bi-cast vinyl beds: panel platform bed and sleigh bed. Matching case pieces are available in dark merlot finish accented with satin nickel hardware.